The holiday season is upon us, which means even more food! I've tried to change this month to be lower carb than what is even our norm, so we'll see if we can handle it. Also, did you know people usually gain 15 pounds between Halloween and New Year's Eve? 15 pounds, friends. So, one of my goals for this year's holiday meals will be to make healthy versions of what we love to eat. Pies, cookies, cakes, and even some Thanksgiving casseroles are gonna need a bit of a makeover. If I succeed, I'll show you what I've made! If not, I'll show you what I've gained. On that solemn note, here's what we're eating in November! I love broken egg yolks over hashbrowns. Over most things, really, but definitely over hashbrowns, so I'm most excited about this breakfast on a lazy--crossing my fingers in hope--Saturday morning to kick off November. Aaron grew up eating a lot of German-influenced food, and his momma taught me how to make some of those recipes! Bierocks is definitely a favorite around here: rolls stuffed with cabbage, ground beef, and cheese then dipped in queso once they're cooked. Mmmmmm. I'll make 'em in bulk for our Leader Team Night--they're easy to eat while chatting, and that trifle will keep us from a total carb coma. I hope. I talked about our Monday dinners in my Turquoise Table book review, so this menu item is really for them to see. I love to experiment with different combinations during those monthly dinners! Also, eggnog is here, and Ryan cannot resist it. We'll see if the pie meets his expectations. Broccoli beef is my go-to at Panda Express, but I've never made it! This is a similar recipe, so we'll see if it measures up! Also, one time I bought quinoa...and it's still in my pantry. So, we'll get rid of it in this tasty dish. Doesn't spaghetti with eggs sound so weird? Like breakfast and italian become bffs? Apparently the egg is in the sauce, so that's how it works. We'll see! I'll probably do half zoodle or spaghetti squash as well. I will be making this skillet sans corn because...macaroni. The medley as a side has me drooling. Does anyone else drool over veggies? Is that weird? No? Okay, good. 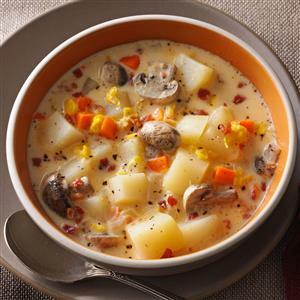 This veggie chowder is definitely one of my faves. We don't do pureed chowders around here because Aaron likes his soup chunky, and this adds lots of chunk. We will probably have some leftover fried turkey from Thanksgiving I'll add as well. This month, lunch will mainly consist of leftovers, but I wanna try this Roasted Butternut Tossed Salad because it looks pretty delish. Aaron and I normally go on a planning retreat--by the way, have you downloaded The Little Planner yet? ?--so we'll need some snacks: Nuts & Seeds Trail Mix and Salty-Sweet Muddy Buddy Mix will hit the spot. And, at some point this month, I'm committed to making this Dark Chocolate Pudding because I love dark chocolate, and I'll probably add pumpkin to it.